The name Galanthus is derived from the Greek gala for milk and anthos for flower. Add the epithet nivalis: ‘of the snow’ and that’s how Carl Linnaeus arrived at the name for the snowdrop in his Species Plantarus in 1735. 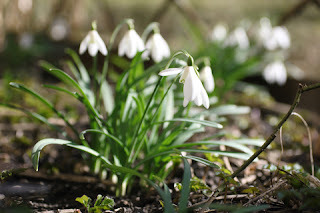 These little early heralds of change in the garden, and spring ahead, have proliferated in abundance in January and into this month, quickly followed by the daffodils. Once you’ve enjoyed the snowdrops’ display you can divide the bulbs and plant fresh ‘in the green’ after the flowers have faded but the leaves are intact. They don’t do well planted as dry bulbs. Now there’s a succession of jobs to be done as February progresses. Pruning will be high on the list for those with roses not already cut back by a half to two thirds. Weak growth on summer flowering clematis can be cut away, hardy evergreen and deciduous hedges trimmed, rambler stems cut and winter flowering shrubs that have finished flowering cut back. Hard prune buddleia, thin lilac branches, cut down the stems of salix and cornus to between 5cm and 15cm from the ground and give wisteria a final pruning. A vast variety of annual flowers can be sown and grown under gentle heat or on an indoor windowsill so there’s a good excuse to visit the garden centre and choose your summer colour schemes. Lily bulbs planted in pots can be grown on indoors or in a cool greenhouse, along with Dahlia tubers and sweet peas. Take root cuttings of acanthus, eryngiums, Japanese anemones, oriental poppies, Verbascum and phlox for propagating and for a February warm-up dig in a top dressing of manure on unused ground to prepare it, breaking up surface soil and removing weeds as you go. And wait in anticipation for the garden delights ahead.